Everyone knows just how fabulous Clinton Kelly. Not only is he great because he’s a New Yorker like me, but he’s also incredibly stylish, funny and sweet (he Tweeted me today!) Mr. Kelly, who co-hosted What Not To Wear for ten years with the equally incredible Stacy London and is currently a co-host on The Chew, just seems to be becoming more and more fantastic… or should I say fabulous! His latest success is his self-help book Freakin’ Fabulous on a Budget: How to Dress, Entertain, and Decorate in the Style You So Richly Deserve, a follow up to his 2008 hit Freakin’ Fabulous: How to Dress, Speak, Behave, Eat, Drink, Entertain, Decorate, and Generally be Better than Everyone Else (which is next on my list of books to read!) 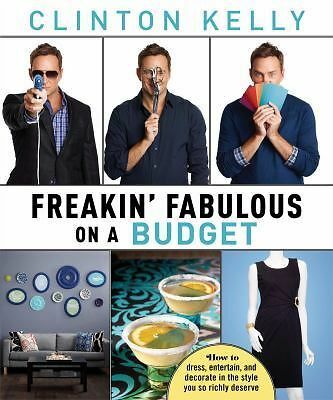 This book focuses on how to be fabulous without spending every penny of your savings. I won’t lie– I read this book in only one day, and found myself craving more of Clinton’s humor and expertise. I definitely recommend you read this book, but I’ll give you some highlights from this masterpiece just to wet your palette a bit! I’ll be totally honest– I want an invitation to one of Clinton’s dinner parties soooo badly! Of course, no cocktails for me. In the food section of his book, Mr. Kelly talks about throwing dinner parties and serving food that is both tasty and inexpensive. He gives recipes for appetizers (or hors d’oeuvres as he calls them for an added flair! ), side dishes, main courses, desserts and cocktails. He also gives pointers about table and restaurant etiquette– when it’s okay to have your elbows on the table, what not to call your waitress, etc.– and answers real questions about party planning. What’s not to love about all of that?! I have no doubt that the Kelly household is immaculately decorated, and Clinton insists that yours can be too! Having come from humble beginnings, Clinton knows what it’s like to want to live in a nicely decorated space, but not having a fortune to spend on it. In his book, he gives amazing do it yourself ideas to spice up your living quarters that are cute and fun! I love how crafty and original these projects are, and am excited to give them a try. They’re classy, stylish and professional-looking, and yet, they’re a fraction of the price you’d pay at a store like Pottery Barn or Pier1 (both of which I adore but cannot afford!) With Clinton’s advice, I can make my room and the rest of my house (with my parent’s approval) look chic and stylish in a one-of-a-kind way. Clinton Kelly knows what’s up when it comes to fashion, so the advice he gives in this book is utterly priceless. Seriously, who doesn’t want a little piece of Clinton’s endless supply of fashion-related knowledge? Sure, the advice is geared more towards adults (I’m almost 17! ), but his advice is timeless and can last me a lifetime. Mr. Kelly stresses the importance of getting dressed to show people how you deserve to be treated, a concept that I think most women– and even girls my age– fail to grasp. What I think might be my favorite bit of his advice, though, is that this process may take time but it’s worth it. He wants women to understand that they’re worth it, and that they shouldn’t have to sacrifice their style and look in order to pay the bills or make others happy. I think that’s a lesson that most women need to learn, and I think this book is the perfect way for them to do that. The last section of Mr. Kelly’s book is about life: How to get through those awkward situations that you never know how to handle, how to properly use your and you’re, etc. Basically, now that food, decor, and style are out of the way, Clinton wants to teach you how to be an overall fabulous person. I personally believe that there’s something for everyone in this section, because no one is perfect (except for Clinton Kelly himself of course!) and there’s advice for just about everything there, from teeth whitening to posture and more. So if you’re tempted to skip this last section, don’t! So, now that that overview is over, here are my final thoughts: I grew up watching Clinton and Stacy on What Not to Wear. Now, I can continue to blossom under Mr. Kelly’s advice– which feels personal despite the fact that it was written for a general audience. This is a book that I want to own, not just read, and bring with me to college and beyond. I want to be able to pass this book down for generations, so I can teach my daughters, granddaughters and so on how to be successful, stylish and respectable women. I want anyone reading this to know that they, too, are worth it, and that Clinton Kelly can teach them that, just like he taught me. Lastly, I want the fabulous Clinton Kelly to know how grateful I am that he shared this advice with us, the women of the world. Even if he never sees it, he should know how much of a difference he has made in my life, and probably the lives of many, many other women.